What are virus and virion? Ans: Viruses are infectious particles consisting only of the viral genes enclosed in a shell made up of proteins. The infectious complete body of viruses is called virion. Virion is composed of nucleic acid and capsid. Therefore, viruses are generally called nucleocapsid. What are viral genomes? Give their nature? Ans: The genomes of different viruses (sets of genes) may consist of double-stranded DNA, single- stranded DNA, double-stranded RNA, or single-stranded RNA. Thus, a virus is called a DNA virus or an RNA virus. The genome is organized as a single linear or circular molecule of nucleic acid. What is meant by haploid and diploid genomes in viruses? Ans: The genome is organized as a single linear or circular molecule of nucleic acid. The smallest viruses have only four genes. But the largest have several hundred genes. The virions with single copy of gene are called haploid. The retroviruses contain two identical RNA strands. They are called diploid. What are capsids or capsomeres? Ans: The protein shell that encloses the viral genome is called a capsid. It may be rod-shaped (helical), polyhedral, or more complex in shape. Capsids are built from a large number of protein subunits called capsomeres. But the number of different kinds of proteins is usually small. 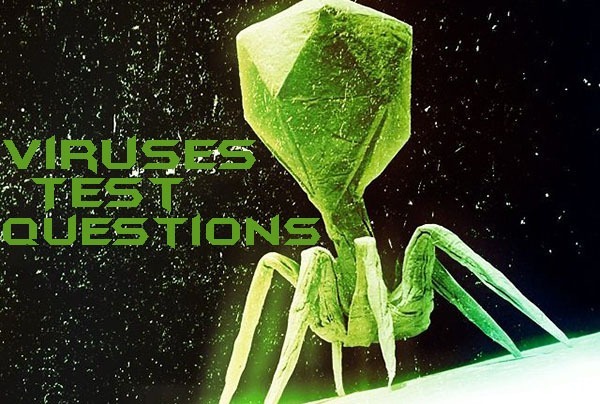 What is bacteriophage? Give its types? Ans: Bacteriophage infects bacteria. Bacteriophage has seven types. These seven phages are named type 1 (T1), type 2 (T2), and so forth. They are named according to the order of their discovery. The first phage (T1). infects the bacterium Escherichia coli. What are envelopes? Give its origin? Ans: Some viruses have accessory structures like envelopes. Envelopes help them to infect their hosts. Influenza viruses and many other viruses found in animals, have membranous envelopes. The envelopes cover their capsids. These envelopes are derived from membrane of the host cell. The envelopes contain phospholipids, proteins and glycoproteins. What are retroviruses? Name special enzyme present in them? Ans: The RNA viruses which can convert their single stranded RNA into double stranded DNA are called retroviruses. These viruses have special enzyme called reverse transcriptase. This enzyme is responsible for the conversion of RNA into DNA. What are tumor or Oncoviruses? Ans: These ate single stranded RNA retroviruses or Oncoviruses. Their diameter is about 100nm. Their shape is spherical. They are enveloped by plasma membrane of the host. These viruses have been known for many years. These viruses are widely distributed in nature. They produce tumor in a number of animals like fowl, rodents and cats. What are host range and key and lock in replication or viruses? Ans: Each type of virus infects only a limited range of hosts. It is called its host range. Viruses identify their host by a lock-and-key. There are specific receptor molecules on the host cells. Similarly, some proteins are present on surface of the virus. These receptors and proteins are involved in lock and key attachment. What are lytic and Lysogenic cycles? Ans: In case of Lytic cycle, bacteria burst and release a large number of phage. In case of Lysogenic cycle, bacteria do not burst. Viral DNA incorporates in the bacterial DNA as prophage. It remains there in inactive form and replicates with the replication of bacterial DNA. Sometimes, it comes out during process of induction and start lytic cycle. Differentiate between Horizontal Transmissions Vertical Transmission? Ans: In case of Horizontal transmissions, virus infection spread from external source to plant. It may spread from leaves to leaves. In case of Vertical transmission viruses are transferred from one plant to other plants by asexual propagation and infected seeds. What is Tobacco Mosaic disease? Give its symptoms? Ans: TMV is RNA virus. Its capsid is coiled rod like. It attacks on the leaves and stem of plant. The leaves become wrinkle and molted. Mosaic appears due to molting. These mosaics are present in the form of light green spots. The leaves become narrow and stunted. What is Cotton leaf curl Viruses (LCV)? Which disease does it causes? Give its symptoms?